Remember Bhagya Reddy Varma (May 22, 1888 – July 2, 1950) the “Father of Dalit Movement in Andhra Pradesh” on his birth anniversary. His original name was Madari Bhagaiah and he was founder of Adi Hindu Movement in Andhra Pradesh. 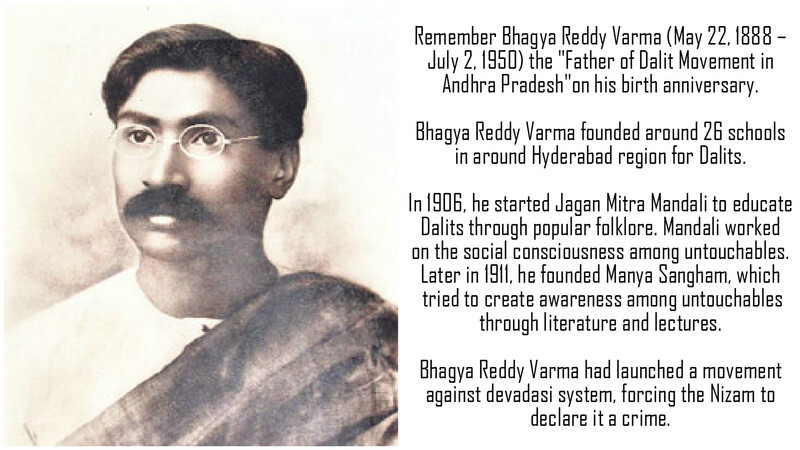 Bhagya Reddy Varma was born in a Dalit, Mala caste family in the princely Hyderabad State to Madari Venkaiah. Bhagya Reddy Varma founded around 26 schools in around Hyderabad region for Dalits. He established Dalit panchayat courts to settle disputes among dalits. He chaired All India conference of Schedules castes held at Lucknow on 27, 28 December 1930, to support send delegation to Round Table conference. Babasaheb Ambedkar was present in this meeting. In 1906, he started Jagan Mitra Mandali to educate Dalits through popular folklore. Mandali worked on the social consciousness among untouchables. Later in 1911, he founded Manya Sangham, which tried to create awareness among untouchables through literature and lectures. Bhagya Reddy Varma had launched a movement against devadasi system, forcing the Nizam to declare it a crime.